Custer Abandoned is a unique study with an untold perspective about the Little Big Horn Battle and Custer’s highly criticized strategy and defeat. For the first time a book has been written and devoted to make an indisputable case that Custer should not be blamed for the destruction of himself and part of his regiment—that blame rests upon the shoulders of an American brigadier general. The Indians killed Custer but Custer’s death was undeniably caused by the neglect and disappearance of a brigadier general who abandoned the campaign at its height and neglectfully retreated to the Big Horn Mountains to fish and hunt while waiting for long-delayed reinforcements. A detailed analysis and critique of the brigadier general's retreat and abandonment of Custer. With the colored photos and annotated topographic maps, the 200-page book vividly illustrates the 1876 Sioux War in detail. The reader will be immersed into the Powder River Country and the June battles of this tragic campaign. For additional information regarding the availability of the book, please contact the author via the text box below. The above photo shows the location of Reynolds' Powder River Ambush site where his battalion shredded without provocation a sleeping Northern Cheyenne village on March 17, 1876. 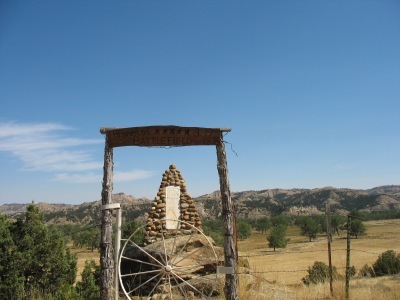 The village was located in the grove of cottonwoods in the middle distance behind the river-stone monument. 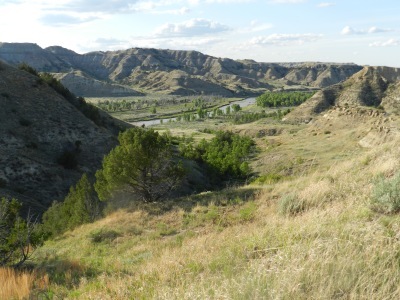 The North Dakota Badlands shown above are located near Medora, North Dakota with the Little Missuri River flowing diagonally from left to right in the photo center. General Terry with Custer struggled across these badlands on their way to the Powder River Country. 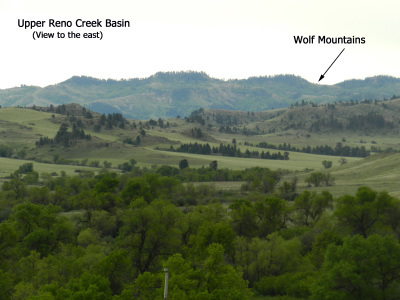 The above photo points over Reno Creek toward the distant Wolf Mountains. Custer crossed over these mountains into this valley on his way to the Sioux and Northern Cheyenne village that was located along the nearby Little Big Horn River. 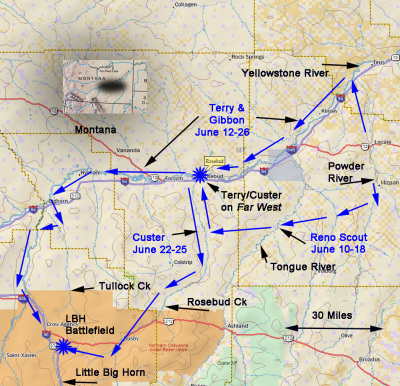 This map illustrates Custer's final march to the Little Big Horn Battlefield on June 25, 1876.​ Also illustrated is Major Reno's extended scout beginning June 10th as his battalion struggled to locate the Indian village. The map to the right illustrates the Rosebud and Little Big Horn Battle sites. 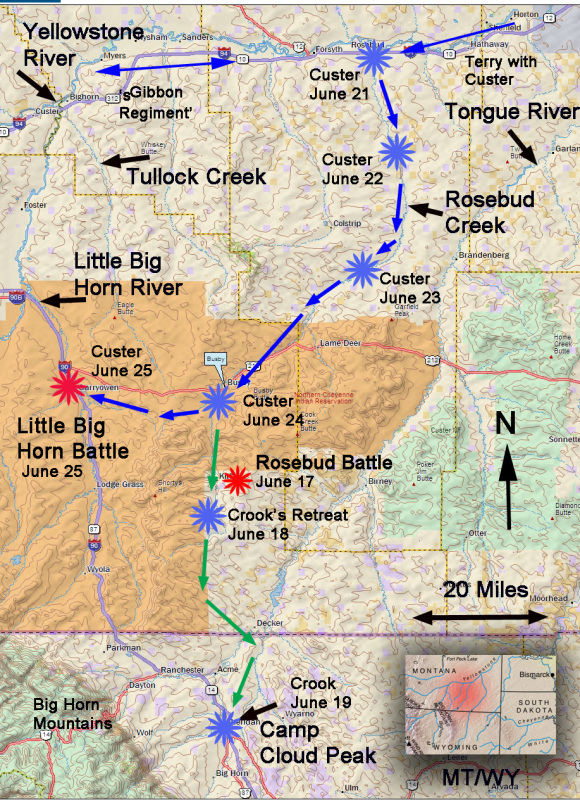 Crook's retreat after the Rosebud battle is shown along with Custer's advance up Rosebud Creek to the Little Big Horn. The background photo on this page is of the lonely and quiet Rosebud Creek valley in southeast Montana. At this location, Geneeral Crook's brigade was ambushed by thousands of Sioux and Northern Cheyenne on June 17, 1876. Crook was distracted and relaxing with his officers and as a result, the outcome was a disaster for the military. 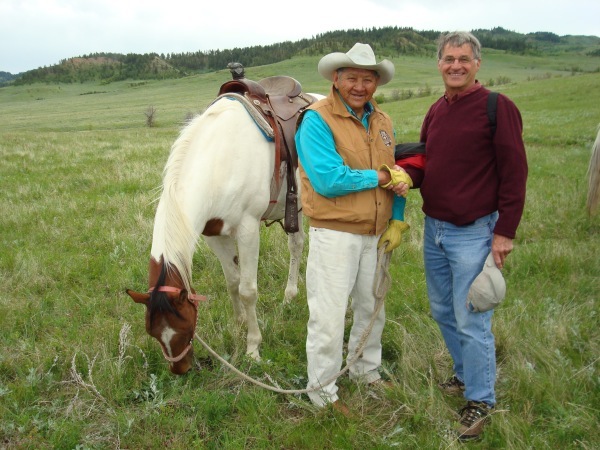 The author is shown with his Crow Indian guide Chief Charlie Real Bird at the beginning of their tour down Reno Creek. Chief Real Bird is shown on the left in the photo. This tour retraced Custer's final ride with his twelve-company 7th Cavalry of which five were massacred by the Sioux and Northern Cheyenne warriors. please contact the author at fgientke@hotmail.com.